The RIDGID® 920 Roll Groover takes grooving to a whole new level. With a capacity range of 2"-24" diameter pipe, the 920 has the largest capacity of any RIDGID roll groover. 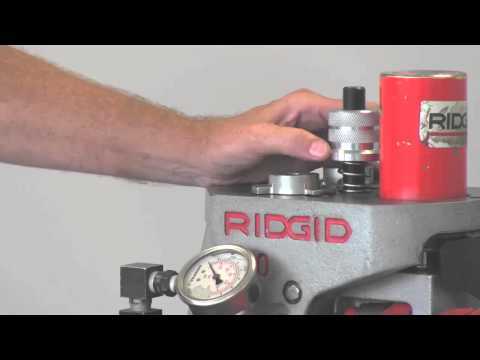 The 920 mounts to the RIDGID 300 Power Drive for use in the field or shop. Also available is the RJ624 Large Diameter Pipe Support for grooving pipe up to 24" in diameter, a perfect complement to the 920 Roll Groover. Largest grooving capacity in its class. Transportation Mode – Detachable wheels enable one man to easily move the 920 around a jobsite. Also available is a Model No. 32 Transporter. Patented Depth Setting Gauge – Easy and accurate groove depth setting does not require adjusting the protective guarding. Built-in Pressure Gauge – Helps operator monitor hydraulic pressure to control flare and optimize groove time. Front Roll Set Change-Out – User can switch groove roll sets quickly and easily. Easy Adjust Support Legs – Helpful when leveling the groover on uneven ground. 14" - 16" Schedule 5 & 10 steel, stainless steel and aluminum. 18" - 24" .250 wall steel, stainless steel and aluminum. 2" - 8" Schedule 40 PVC. 2 1/2" - 4 Schedule 80 PVC. 2" - 8" copper (K & L). 2 1/2" - 8" copper (K, L, & M). 3" - 8" copper (DWV). * 8" grooving is not recommended for Sch. 40 if pipe hardness is above 150 BHN. Note: Use of all roll sets on both carbon and stainless steel pipes can lead to contamination of the stainless material. This contamination could cause corrosion and premature pipe failure. To prevent ferrous contamination, use roll sets dedicated for stainless steel grooving. Note: Consult groover manual for exact capacity specifications. Please give me the answer how to solve the problem which is for the piping 6&quot; to be taken out from grooving machine without any reason.